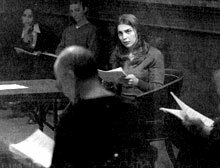 Trials began as a staged reading at New Dramatists, a New York City institution that supports the work of living playwrights. Todd London, Artistic Director of New Dramatists, was interested in exploring whether verbatim transcriptswith their characters and dramaconstitute a play, and whether theater had something meaningful to offer our experience of these events. Because of my experience working with recorded interviews and primary sources, I was asked to direct and help shape such a piece. The result was a surprisingly poignant and moving, if often hilarious, piece of drama. In the version presented at New Dramatists, I cast three women as Monica, and they rotated into performance at emotionally motivated places in the text. 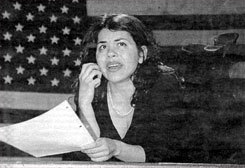 In the version we brought to HBO's US Comedy Arts Festival in Aspen, a single actress played Lewinsky, her Grand Jury scenes intercut with delightful and haunting telephone scenes with Linda Tripp. 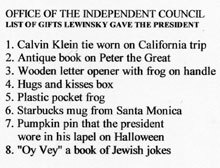 Additional texts included personal notes between the President and Lewinsky; the list of gifts they exchanged; and the Independent Counsel's clinical chronology of the emotional day Lewinsky was apprehended in the mall. *The New Dramatists reading included Culver Casson, Abigail Revasch and Emme Shaw with Lori Tan Chinn, Quincy Long, Akili Prince, James Urbaniak and Damien Young. "The strong applause and vigorous audience discussion that followed marked the evening as something more than a stunt... The actors as much as the audience seemed mesmerized by the hourlong experiment."